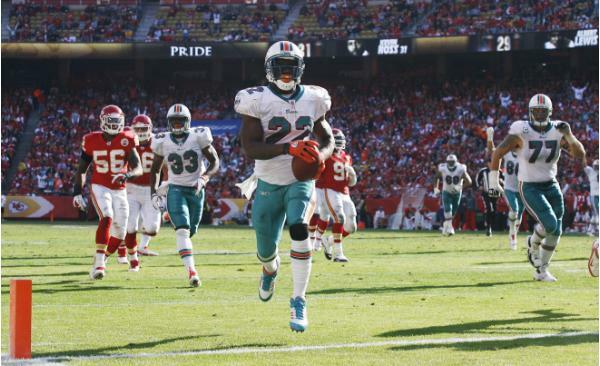 The Miami Dolphins defeated the Kansas City Chiefs 31-3 in a tough bolstering surrounding crowd at Arrowhead Stadium. Miami improves to 1-7 and the Chiefs decrease to 4-4 on the season. With the Miami Dolphins lacking to score points or hold leads going into the fourth quarter, they have showed their offense or defense can spark at anytime. Cameron Wake, Kevin Burnett, Yeremiah Bell, and Jimmy Wilson led the charge on the defensive side of the ball. The unstoppable defense only allowed three points against a red hot Chiefs team. With the offensive line not giving Matt Cassel any time to settle in the pocket, the Dolphins took adavantage recording five sacks in the win. Matt Moore tied his career high with three touchdowns. Moore contributed 244 passing yards and three touchdowns. The reason why he was so successful was the offensive line. Great protection earns great performances. Reggie Bush finally looking like the “Reggie of the University of Southern California”. The running back earns player of the game in my mind. He was all over the place from catching passes from Matt Moore to burning the turf off the field. Reggie Bush contributed 142 all purpose yards and one touchdown. If the Dolphins could just finish games they would be an above .500 team easily. Having the lead going into the fourth has been a problem this season but today they finished and earn themselves a fantastic win. Next week the Dolphins will take on the Washington Redskins, some say this should be an easy win but you never know what Miami team will come ready to play on Sunday. Miami Dolphins Preview: Can the Dolphins stop the Chief’s run? The Kansas City Chiefs have won five consecutive games and the Miami Dolphins are looking for a win that can turnaround their season against a rough and tough Kansas City team. Miami Dolphins’ coach Tony Sparano is always anticpating for a big win but it just hasn’t come yet. The Dolphins have a Lebron James-esque appearance, can’t perform in the fourth quarter. Today might be a big step and show some light if they have the eager to beat th e Chiefs. The matchup should be a good one, besides both of the teams records. In week 7, Kansas City snuck a game of their own against the San Diego Chargers, won by three points in overtime. In week 7, the Miami Dolphins could not score enough against the Giants to leave with a win. In the past four wins Matt Cassel has been given a lot of time especially last week against an elite defense. The defensive side of the Miami Dolphins has shown some light at the midpoint of the season. Last week against the Giants, the defense was visible for all quarters besides the fourth. Both players are similar in multiple ways, they love the deep threat and and have the ability to make spectactular plays. Dwayne Bowe has 558 receiving yards and four touchdowns on the 2011-12 season . Brandon Marshall has been underplaying what he can show this season only recording 538 receiving yards and one touchdown in seven games. The Miami Dolphins are searching for their first win, let’s see if they can control the fourth and win the game.